Andrey Filippov was born in 1959 in Petropavlovsk-Kamchatsk, Russia, and graduated from the Moscow Art Theater School. 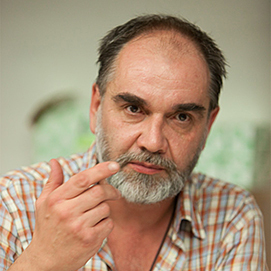 He helped establish Russian conceptual art in the 1980s and 90s and, in 1987, became a member of Club of Avantgardists. In 2009, together with Yuri Albert and Victor Skersis, he founded the art group Сupid. He has had numerous solo exhibitions at galleries and museums in Moscow, including the Stella Art Gallery, E.K. ArtBureau, Proekt Fabrika, and the Multimedia Art Museum. He has also had solo exhibitions in Germany and Greece. His work has been featured in group shows in Russia, Germany, Greece, Spain, Italy, and France. Filippov lives and works in Moscow.